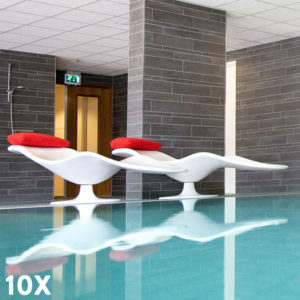 WellCome Wellness has various wellness facilities where you can relax. There is a Finnish sauna, infrared sauna and Turkish steam bath and the possibility to take a cold and hot shower. The principle of a sauna is based on heat, humidity and cooling. The high temperature of the saunas, which lies between 70 and 95°C, stimulates the functioning of the organs. There is an oxygen-rich blood flow of the internal organs. Muscles and joints regain their suppleness. Due to the heat development, the skin starts to perspire and all kinds of waste products leave the body. The body is therefore thoroughly cleaned. The well-known orange peel (cellulitis), which is (partly) the result of excess fluids and toxins, does not get a chance to develop further. After the sauna, take the time to cool down well under a cold shower. A proper cooling not only gives a refreshing feeling, it also stimulates the functioning of the circulatory system and nervous system. Dead skin cells can be removed, making your skin more elastic and stronger and looking soft and radiant again. Infrared radiation penetrates the upper skin layer without heating the skin. The effect is deep heat, which is absorbed by the body. Blood circulation is increasing and the skin is bleeding better. Blood vessels in the underlying adipose tissue absorb the depth of heat, become wider and in this way ensure a better circulation of the adipose tissue. The fatty acids stored in the fat cells are dissolved and disappear from the body along the lymph system. In short, all kinds of waste products leave the body. The heartbeat increases slightly, resulting in a passive fitness training. Similar as warming up, preventing sports injuries. Infrared heat can help break down cellulite. Cellulite consists mainly of fat and water. An infrared sauna can reduce cellulite because the heat penetration of infrared saunas goes deeper than that of traditional saunas and gives up to ten times the level of heat in the tissue. This makes an infrared sauna significantly more effective in reducing cellulite than a traditional sauna. Because the infrared cabin is not a hot sauna, you do not have to cool down with cold water. This would only negate the positive effect of the infrared. A lukewarm / warm shower is sufficient! In the steam bath the temperature is about 50 ° C with an air humidity of 80% -100%. There is a dense mist, which is enriched with an essential oil of mint or eucalyptus. Together with the fine steam, this has a beneficial effect on the airways. The influence of the steam and heat on the skin opens the pores through which waste products are removed and the skin is cleaned. In addition, the pores of the skin are already activated, which is conducive to perspiration during the next sauna round. The difference between a sauna and a Turkish steam bath is in the temperature and humidity. In the sauna the temperature is high and the humidity is low. This is exactly the other way around in the steam room. After a quarter of an hour in the steam bath, the body is as warmed up as a quarter of an hour in the sauna. This is particularly noteworthy because a steam bath is about 50 degrees colder than a sauna. The reason for this is that the temperature is transmitted by the moisture that condenses on your skin. The swimming pool at WellCome Wellness is 14 meters long and has a pleasant temperature of 30 degrees. Come relax or swim active laps. In the relaxation area at the swimming pool, you will not miss out on anything: the space is equipped with comfortable loungers and seating areas with various magazines for reading. Want something to eat or drink? You can place your order at the reception!